Dr. King was reluctant at first; he was preoccupied with his Poor People’s Campaign. But he came to see that the Memphis strike converged with his national agenda for economic equality and social justice, so he accepted. After Dr. King arrived, Mr. Kyles invited him to a home-cooked soul food dinner. Aware that Dr. King was perennially tardy, Mr. Kyles promised to pick him up promptly at 5 p.m. at the black-run Lorraine Motel, where Dr. King was staying, in Room 306. The date was April 4. But when Dr. King later phoned the Kyles home to confirm the invitation, he learned that the dinner would actually be at 6. So when Mr. Kyles arrived around 5, Dr. King procrastinated. Before they left, Mr. Kyles picked out a necktie for Dr. King to wear to dinner. When they finally emerged from the room, on a second-floor balcony, Dr. King was gunned down by a sniper from across the street. Mr. Kyles died on Tuesday, at 81, in a Memphis hospital. He was the last surviving witness to that motel-room conversation (Mr. Abernathy died in 1990) and, from the balcony, to Dr. King’s assassination. “A lot of people claimed to have been on the balcony when Dr. King was shot down,” Mr. Kyles said. Why had he been there? He often asked himself that question, he said. Mr. Kyles vividly recalled that evening in the documentary film “The Witness: From the Balcony of Room 306,” which was nominated for an Oscar in 2009, and in an interview for a publication put out by the Funders’ Network, a group of grant makers. He remembered emerging from the room with Dr. King at about 5:45. Hoping to keep the 6 p.m. dinner appointment, Mr. Kyles was trying to hurry him to a white Cadillac, borrowed from a local funeral home, that was waiting for them in the courtyard below. Dr. King was talking to Mr. Branch over the balcony railing when a single rifle shot — “kuh-PIE-yah!” was how Mr. Kyles described the sound — reverberated from across the street. Mr. Kyles dashed back into the room to summon an ambulance, but the motel’s telephone operator, alarmed by the shooting, had left her switchboard and run outside. The woman, who was the motel owner’s wife, had a heart attack in the courtyard and died a few days later. Mr. Kyles covered Dr. King’s body with a bedspread, up to the knot of the necktie he had chosen. He instinctively removed a crushed Salem cigarette, mindful that Dr. King had been self-conscious about smoking and worried that young people might discover his vice. Dr. King’s murder shocked the world, provoked riots in many of the nation’s cities and devastated Memphis emotionally. It also galvanized the sanitation workers and their supporters. On April 8, tens of thousands of demonstrators silently marched to honor Dr. King’s memory. A week later, the city agreed to certify the union, safeguard sanitation workers and guarantee higher pay. That May, caravans of protesters converged on Washington for Dr. King’s Poor People’s Campaign for economic justice. Mr. Kyles was born in Shelby, Miss., a Delta town, on Sept. 26, 1934, to the Rev. Joseph Henry Kyles and the former Ludie Cameron. He was named for the prophet Samuel, but after his mother saw him baptizing neighborhood pets and memorializing dead birds, she began calling him Billy, after the evangelist Billy Sunday. When he decided to return to the South, his brothers scoffed. “You’re in the promised land,” he recalled them saying. He settled in Memphis, a segregated city, in 1959 and became the founding pastor of Monumental Baptist Church. In perhaps a foreshadowing of Dr. King’s visit in 1968, he met with the civil rights leader Medgar Evers five years earlier at Evers’s Mississippi home shortly before Evers was murdered in his front yard. Mr. Kyles became a central figure in Memphis’s struggle for civil rights. In 1961, his daughter Dwania was one of 13 black first graders to integrate Memphis public schools. “We did not want to make the mistake that Little Rock had made and send high schoolers,” he said, referring to the hostile reaction to a similar integration effort in Arkansas in 1957 that compelled President Dwight D. Eisenhower to send in federal troops . He was later arrested for refusing to sit in the back of a segregated city bus. Faced with the threat of a bus boycott, the city desegregated its buses in 1964. Mr. Kyles was instrumental in the largely peaceful integration of restaurants and other public places in Memphis and the elimination of a system of runoff elections, which impeded minority candidates. (Eliminating the runoff helped elect the city’s first black mayor, Willie W. Herenton, in 1991.) He also formed a chapter of Mr. Jackson’s civil rights organization Operation PUSH (People United to Save Humanity) and was later a board member of the National Civil Rights Museum, established at the site of Dr. King’s assassination. 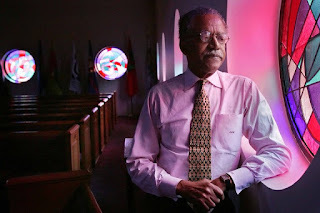 “He was a founding father of the New Memphis and the New South,” Mr. Jackson said at a tribute to Mr. Kyles this month at the church he led for 55 years until he retired in 2014. In addition to his wife, the former Aurelia Kennedy, who confirmed his death, Mr. Kyles is survived by their daughter, Epernay; four children from a previous marriage, to the former Gwendolyn Hart — his daughters Dwania and Drusheena and sons Dwain and Devin — and five grandchildren. Mr. Kyles recalled that Dr. King, during his final hours in Memphis, had left a deep impression. The night before his assassination, at a local church, Dr. King delivered his ringing “I’ve been to the mountaintop” speech, in which he expressed premonitions of his death. Dr. King had predicted that he would not live past 40. When he died the next evening, he was 39.